« It’s cold outside! Why not stay inside and make pretzels? This week in Dairy: shake up some butter! Here’s a project: Let’s say you are stuck inside because it’s 6° outside and your children are climbing the walls with their endless supply of energy. How to exhaust them? Take a jar with a tight lid, pour in a cup of heavy cream, and tell them you are holding a contest to see who can shake the jar the longest. After about 10 minutes, they will get sick of this and go back to flinging themselves off of the sofa, but by then you are almost halfway there. Take over, keep shaking, and – lo and behold – you have made yourself some butter. No churn required. 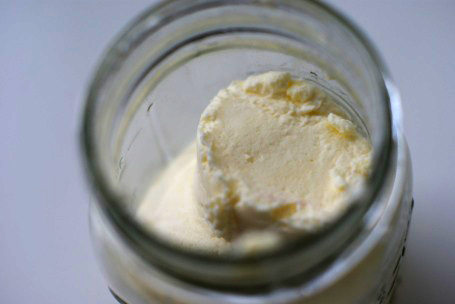 Inside the jar, you will have a soft lump of butter surrounded by buttermilk. You will want to drain the butter milk and rinse the butter a few times (leaving buttermilk in the butter can make it go sour). Depending on its consistency, you can put it into a cup, or shape it into a log. 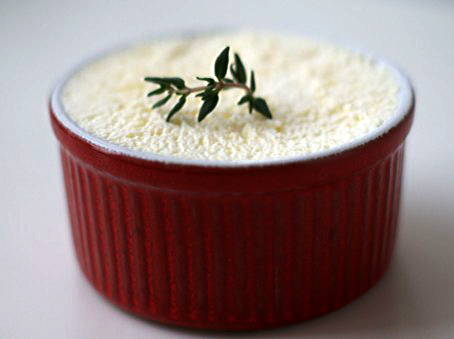 Add salt or herbs if you like, and refrigerate or freeze. Or feed it to your children on toast as a well-deserved snack for all that shaking. This entry was posted on January 25, 2011, 8:10 am and is filed under kids, Kitchen Alchemy. You can follow any responses to this entry through RSS 2.0. You can leave a response, or trackback from your own site. Love the carrot juice idea! We are just starting the Little House books, but I remember trying to make maple syrup candy in the snow one year. Would love to try that, but somehow NYC snow doesn’t sound all that appetizing. Martha Stewart called, she, like, wants her photos back. Did it after we left your apt! Delish, easy and so much fun! Site looks great.